The Train Like a Mother 10K Run, a 15-week plan, is best for someone tackling a 10K (6.2 miles) for the first time, coming back from injury or pregnancy, or wanting to run a strong effort on 10K race day and cross the finish line with a smile on her face. 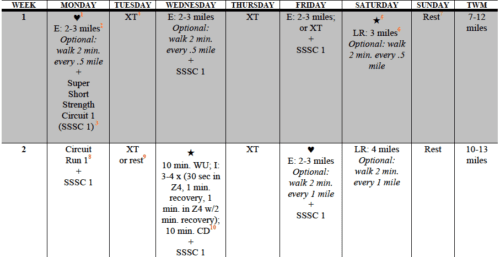 Optional Walk breaks are built into the workouts through Week 7; if you need to continue to take them after that, feel free. (Forward motion at any speed is the key.) You’ll run a 5K at the end of week nine, and we’ll help you use your finishing time from that effort to figure out your pace for the culminating 10K. LONGEST LONG RUN DISTANCES: One 6-7 miler, one 7-8 miler. A mother-runner-friendly 10K training plan. Designed by Coach Christine Hinton, the genius behind the popular and successful plans in our second book, Train Like a Mother, the 15-week plan is (much) more flexible than our hamstrings: Each week, there’s a workout you can bail on and one that’s integral for your success. Plus, the workouts range from intervals to circuit runs, keeping things interesting for both your body and mind. You’ll also receive a weekly Challenge newsletter in which we preview the upcoming week of workouts, as well as have a Q+A with Coach Christine, gear giveaways galore, and discounts on training essentials. Optional Train Like a Mother Tee + Medal. Because we know some of you like bling, some of you like tees, some of you like both, and some of you already have overflowing drawers, we are offering the Challenge tee and medal as options. The train like a mother tee, a super soft lifestyle cotton/poly blend available from XS to 4XL, is $25 (shipping included in price); the Train Like a Mother medal is $12 (shipping included); and the tee + medal combination is $30 (shipping included). Sweet Discounts—and Giveaways—on Races and Gear. Throughout the Challenge, we’ll offer deep discounts on some of our favorite running things, as well as straight-up giveaways. In addition, being a Challenge member grants you a discount on a handful of race registrations from the Flying Pig marathon, half-marathon, 10K, or 5K to the Hippie Chick half-marathon and quarter-marathon (a super fun, 10K-ish race). This 15-week program is best for someone tackling a 10K (6.2 miles) for the first time, coming back from injury or pregnancy, or wanting to run a strong effort on 10K race day and cross the finish line with a smile on her face. Athletes ready for this challenge should be able to run/walk three or four miles comfortably. If that feels like too much for your running level or schedule, consider joining the Stride Into the New Year program. No. $52.50—or $.50 a day for 15 weeks of training—is for the comprehensive training plan, unlimited support, miles of resources, exclusive podcasts, and swag package, which will help you achieve a strong 10K. Come spring, you will participate in the organized 10K of your choice; you can also choose to run a 10K on your own, if that works better for you. We also have a handful of exclusive discount codes from several races around the country where Another Mother Runner will have a presence at the expo and organized #motherrunner pre-race meet-ups. Stay tuned for details. Within a few weeks of registration, every participant in a Train Like a Mother program receives a stocked swag package with some of our favorite training essentials. Domestic #motherrunners are charged $6 for shipping; international #motherrunners are charged $12 for shipping. The Train Like a Mother tee and medal have no shipping charges associated with them.